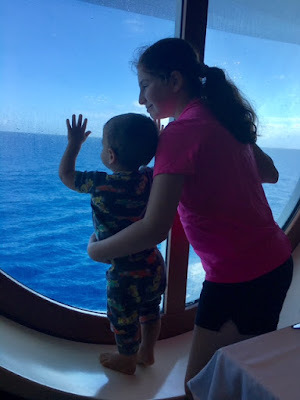 For months, I'd wondered what it would be like to cruise with a teen, a tween and a baby. We've done several Disney cruises, and both Max and Sabrina loved hanging out at the kids' club (read: Dave and I were free to chill). 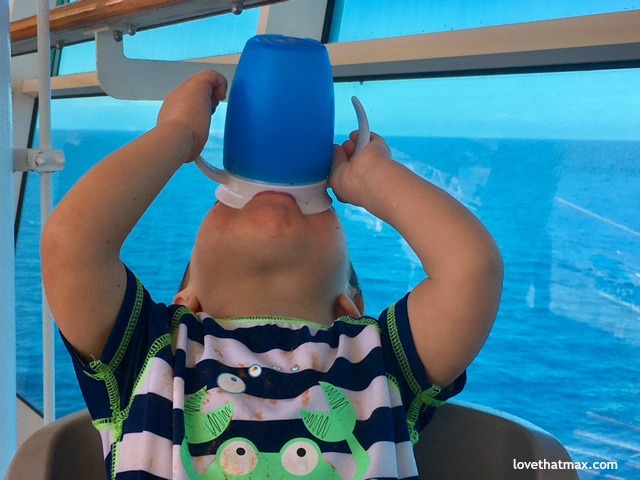 But Max has aged out of kids' club and teen ones don't have the supervision he needs, so we had to find a new cruise fix. 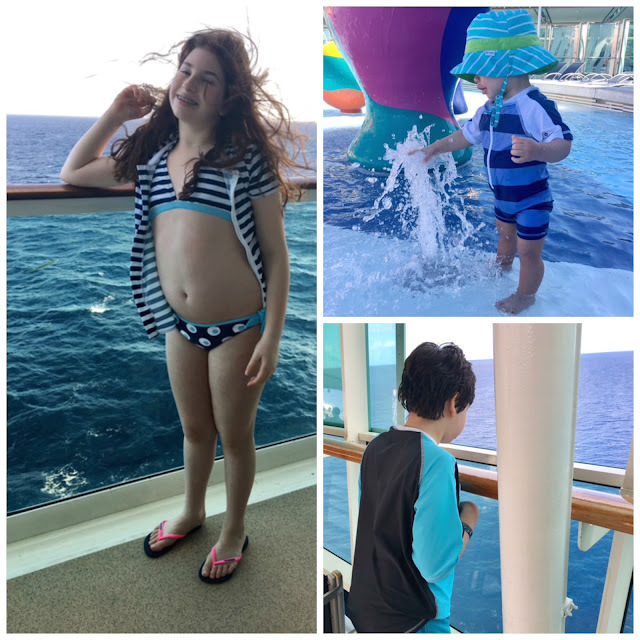 We booked a five-night Royal Caribbean International cruise through Autism on the Seas (AOTS), departing from Ft. Lauderdale, for winter break. Contrary to its name, AOTS services children and adults with a variety of needs including Down syndrome, cerebral palsy and cognitive and intellectual disabilities. They also sail with Disney, Norwegian, Carnival and Celebrity, but Royal Caribbean was their first partner so props to them. AOTS charges a very reasonable daily fee of $15 to $25 per person, included in the total cruise fare. Our ship, the Independence of the Seas, was booked to capacity (around 4300 passengers) but never felt particularly crowded. It was very clean, and the staff couldn't have been nicer or more courteous. One of Max's favorite activities, not found on any schedule: wheeling Ben around and around the deck. 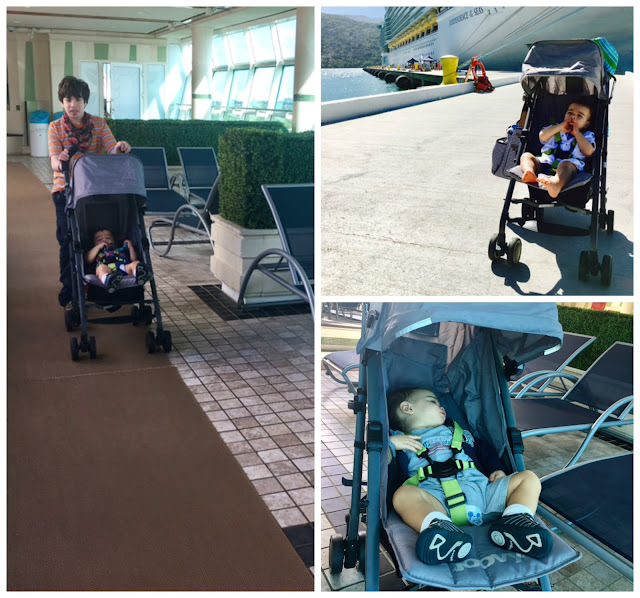 A lightweight yet solid stroller is key to travel contentment when you have a tot (or child with special needs in need of wheels), why I was grateful for our Joovy Groove Ultralight. At 13.9 pounds, it wheeled smoothly and folded up easily. Just as excitingly, Ben enjoyed napping in it. 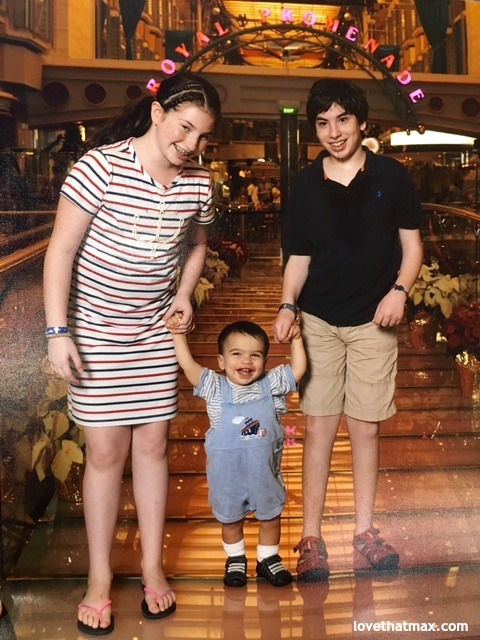 Autism on the Seas made the cruise stress-free, and that's saying a lot when you're on a trip with a child who has special needs. It started with getting onto the ship: AOTS had early boarding, at 11:15 a.m. (they also offered disembarkation at the end of the trip just for our group). Staffers were standing right at the entrance of the terminal to greet us, walk us through check-in and whisk us onto the ship. During the mandatory evacuation drill, our group got to sit inside in a lounge so that kids wouldn't be freaked by the commotion. The AOTS crew, from left: group leader Chris Schwilk and staffers Charles Rotunno, Jon Estrada and Eddie Williams. There were four AOTS staffers for the seven children and teens in the program. AOTS staffers volunteer their time, and other than group leaders pay their own way. Chris is an associate professor of special education at Shippensburg University in Pennsylvania, Charles is a trained ABA therapist, Jon is a behavior specialist working with pre-K kids who have autism and Eddie is a teacher. AOTS had several private activity sessions just for our group, so nobody would have to endure crowds or long lines. 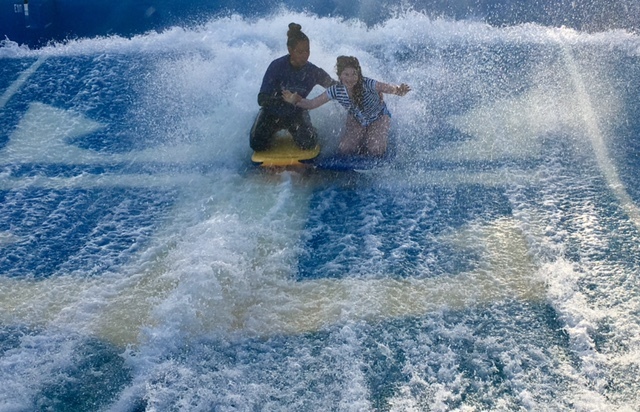 Our group got to go on the FlowRider (simulated surfing), rock climb and ice skate. 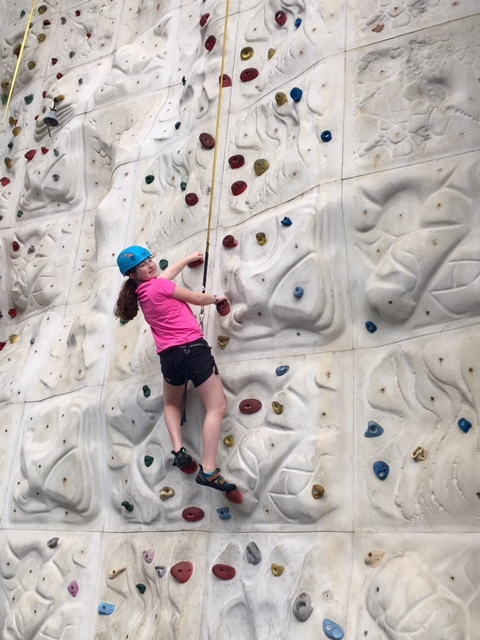 Max got as far as wearing the shoes for the rock wall, then bailed. Amazingly, she stopped snapping selfies of herself to do this. At mealtimes, our group had our own private dining areas. Staffers sat with families, jumping in to help with meltdowns or any other challenges. (Sadly, they did not intercede when Dave and I ordered all the desserts on the dinner menu one night.) For the cruise entertainment—including a dance show, an ice show, a comedy show and Grease—we had reserved seating in the rear of the theater. Always a man of leisure, Max particularly enjoyed hanging in the hot tub; here he is with Eddie, during one of two morning pool time sessions with staffers. When Max took an ice-cream break, Eddie was there to give him a hand. Max and Sabrina had a little competition going to see who could down the most ice-creams in a day; Max won (seven). The last thing you want on a cruise: a sunburn. These swimsuits by Snapper Rock kept the kids protected (they're UV50) and styling. Another key to cruise happiness: a big sister to help you look out the window. AOTS took over one of the ship's conference rooms; during respite they played games, did activities and showed movies. One evening when I came to pick up Max, I was told he'd been bopping counselors with a pool noodle. The AOTS staff also looked after siblings and other young family members as well. Our trip included an extended family of 17, and all the children went to respite. I can't say enough good things about the staffers. They were wonderful with all the children and teens, and went above and beyond. We ran into a situation when Max got it into his head that he wanted to go to the kids club. We were turned away, because Voyagers was only for children up to age 11. Chris spoke with them, and after that they accommodated one very ecstatic Max. We were on call to give him a hand with toileting. That turned out to be a challenge on the day we stopped at Labadee. Dave and I couldn't leave the ship since one of us had to be available. So Chris volunteered to return after lunch and be a point of contact. When the staff called him for a bathroom break, he went. Another day, when the staff tried to reach us on our ship phone but we didn't get the call, they reached out to Chris and again he went. I thanked him profusely. "No big deal," he said, and he meant it. 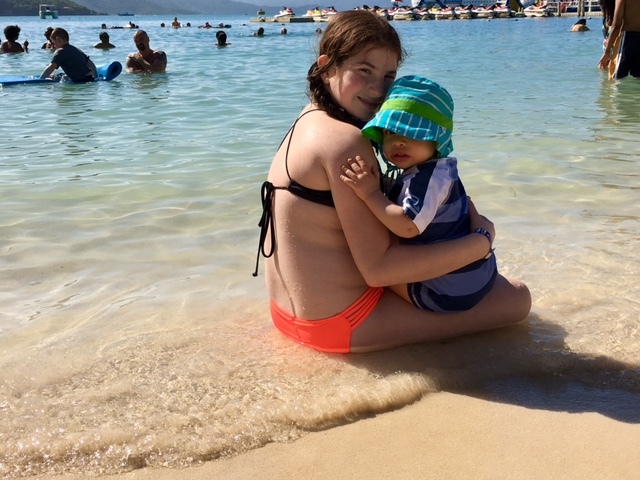 This trip wasn't exactly chill for me and Dave (life with two older children + a tot on the verge of walking = never chill), but it was a ton of fun, I got to read twenty whole pages of a book and we felt relaxed knowing Max and all of us were in good hands. My wake up call was at around 5:00 a.m. every day; his name is Ben. We were the first ones in the coffee shop on the promenade, where Annika would warm soy milk for the baby and give me a cup of ice for my iced coffee. 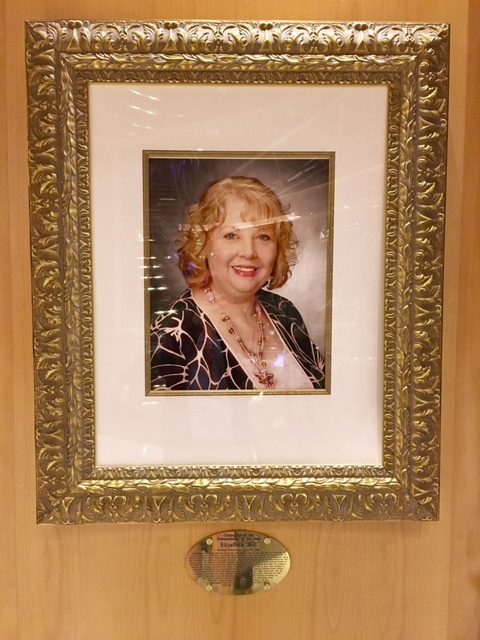 You never do know what you'll find wandering around the ship before sunrise, and I came upon the plaque for the ship's godmother. I did a happy dance in my head as I read it. Elizabeth Hill of Darbyshire, UK, started the Gamelea Countryside Training Trust to help young people and adults with physical and learning disabilities learn a range of horticultural and artist skills, in an integrated setting. They could use those skills to gain employment, including opportunities at Gamelea. Suddenly, I felt extra glad to be on the ship, even if it was way too early in the morning. 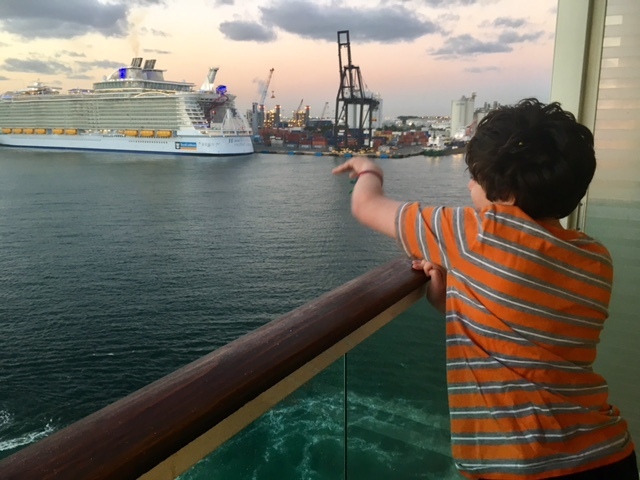 As we arrived back at the port, Max spotted another Royal Caribbean ship. "Next cruise!" he said, pointing to it. Before we had kids, Dave and I liked to go on adventure trips (kayaking in Alaska, hiking in Patagonia). I couldn't imagine spending an entire trip on a ship. But now that we have kids, we love them! Sounds like an amazing adventure for max and that he felt so proud to be included in so much . The staffers look so happy and genuine! Kudos as always to you for sharing all of Max's adventures !!! Wishing you all a spectacular new year of growth and happiness ! The staffers were truly outstanding, and their happiness is totally genuine—ditto for Max! Happy new year, Joyce! I've been toying the the idea of a cruise. Did you feel it was wheelchair accessible? I have a four yr old with cerebral palsy (in the wheelchair) and 2 yr old twins. Would it be worth it or would it be better to wait as far as amenities/activities for toddlers? I'm in the fact-gathering stage at this point. I spotted several adults in wheelchairs on the cruise and one teen. 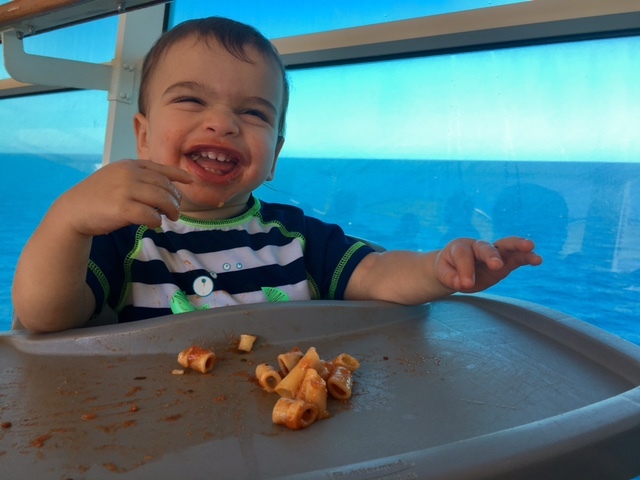 By law, of course, cruises have to be wheelchair accessible, and the kids' clubs would have to accommodate your four-year-old although you would need to be on call to assist with toileting, true for any cruise. You definitely want to call the hotline and discuss ahead of time. I will say, however, that kids' club staffers on the Disney cruise went ahead and helped with that, even though the official policy was that they wouldn't—but there is no guarantee. Once, a staffer on RC also helped Max when they couldn't reach us (but again, no guarantee). Like RC, Disney's nursery (also for kids up to ages 3) charges. On Royal Caribbean, it was a reasonable $6 an hour by day, $8 an hour by night. So you'd also have a place to put the twins. But they might appreciate the whole experience more once they were three, ditto for Disney World. Sabrina was four and Max was six when we first went on a cruise (Disney). Note, I've heard the kids' clubs on the newer Royal Caribbean ships (Oasis, Harmony of the Seas) are more tricked out. Unlimited ice-cream machines are dangerous!!! We had ice-cream for breakfast! Well, second breakfast! It sounds like you had a blast! What did Sabrina think? She loved it! 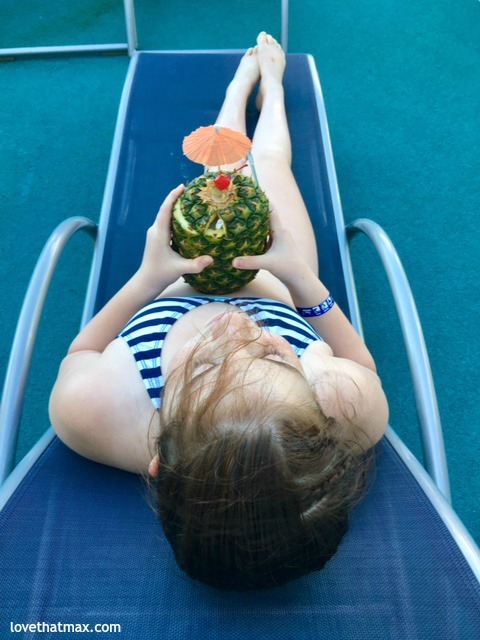 Any time where she can swim for days on end, drink pina coladas out of pineapples and explore is a good time for her. That time when I read this post that it made my heart so happy that... all the tears. 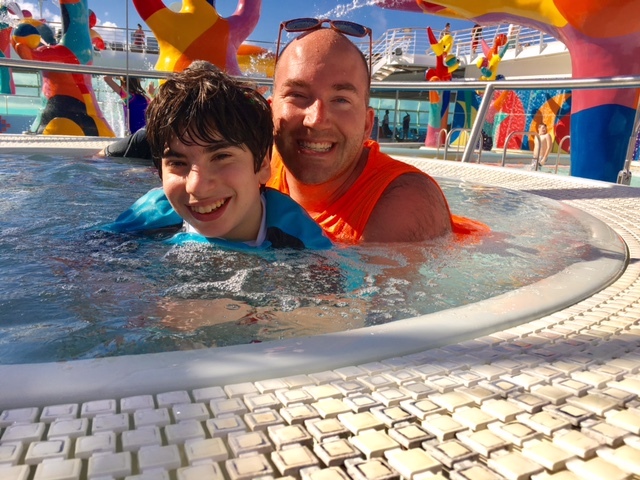 I'm so glad there are AMAZING companies out there that are making these kind of accommodations so that all families can enjoy amazing vacations. I'm definitely going to be mentioning this to my husband, and booking an amazing trip for our family. I am truly grateful that this company exists. Thanks for sharing! 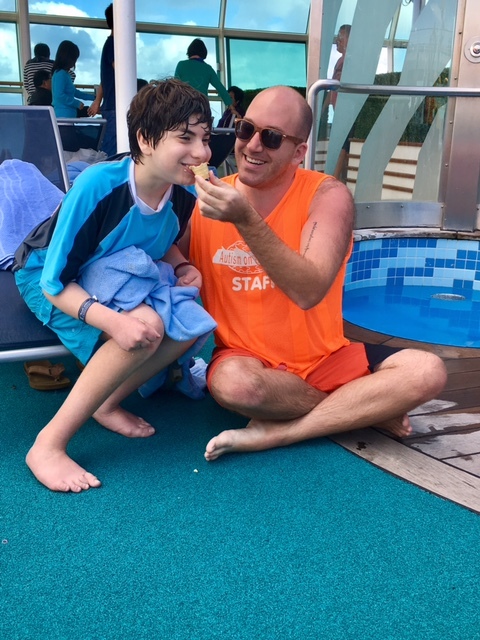 When I was looking at a new school for Luke I learned about autism cruises but didn't get any more information (one of their staff was on one!). I see one in our future. Chris! Thank you for stopping by. Really, YOU and the crew were the gift. Love coming back to this post and rereading all the great times we had! Can't wait for our next cruise with Max and the family! I have never flown or been on a cruise. We live in North Carolina and would have to fly get to Port. My daughter who has multiple disabilities and loves everything Disney, will be 30 in two years. My plan is to take her on a Disney cruise to celebrate. I am so glad that I have learned of autism on the Seas. I plan to use them when we go. 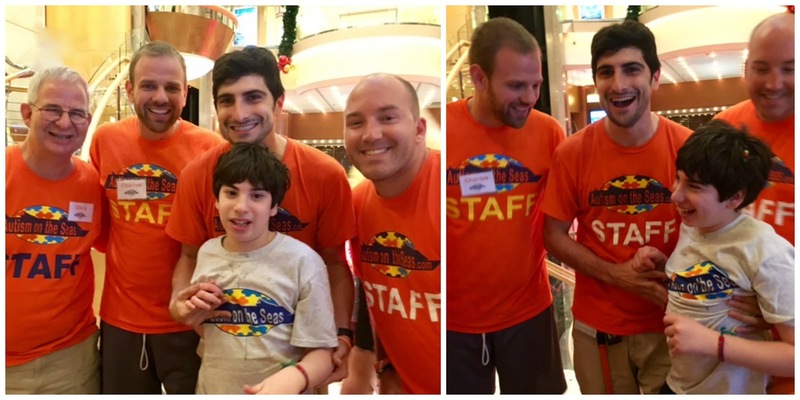 Thank you everyone for sharing so that those of us who did not know about autism on the seas are aware! This overview fills my heart - thank you. I've been lucky enough to travel with AOTS twice including once with Charles, the staff is absolutely amazing. Anything they can do to make the trip as enjoyable and stress free as possible they will.